Hidden behind a busy street in St Catherine’s Ontario, is one of the most powerful gardens on earth. It is small, maybe 200 square feet in size, but the energetic power that fills one who stops by, is divine. This is the Church of Black Moses, Harriet Tubman, the conductor of the Underground Railroad. 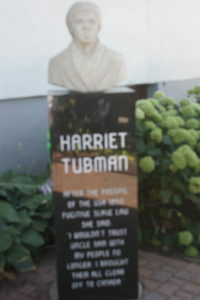 Harriet Tubman was born in 1822 in Dorchester, Maryland. She was badly abused by her slave masters. Yet she dreamed of freedom and in 1849, she achieved that. She escaped and found liberty in Philadelphia. Many of us would have stopped there. We were free but, Harriet returned to lead her family to freedom. She returned many times and is credited with personally saving and freeing thousands of people. When the Fugitive Slave Act of 1850 was passed, she moved to Canada and St Catherine’s became the final stop of the Underground Railroad. Harriet personally escorted thousands to Canada to begin a new life – a free life. As I stand in the garden, holding my beloved’s hand, we feel really proud that it was Canada that welcomed Harriet and her thousands of friends. It was our ancestors that reached out and shared clothing, shelter and food with those seeking refuge and love. and so in honour of Harriet Tubman, who found respect and freedom for herself and thousands of people, let’s be Canadian. This entry was posted in Canada and tagged diverity, freedom, respect, underground railroad. Bookmark the permalink.